SEOUL, South Korea (AP) – North Korea on Wednesday canceled a high-level meeting with South Korea and threatened to scrap a historic summit next month between President Donald Trump and North Korean leader Kim Jong Un over military exercises between Seoul and Washington that Pyongyang has long claimed are invasion rehearsals. The statement by North Korea’s Korean Central News Agency was released hours before the two Koreas were to meet at a border village to discuss how to implement their leaders’ recent agreements to reduce military tensions along their heavily fortified border and improve their overall ties. It called the two-week Max Thunder drills, which began Monday and reportedly include about 100 aircraft, an “intended military provocation” and an “apparent challenge” to an April summit between Kim and South Korean President Moon Jae-in, when the leaders met on their border in their countries’ third-ever summit talks since their formal division in 1948. KCNA said the U.S. aircraft mobilized for the drills include nuclear-capable B-52 bombers and stealth F-22 fighter jets, two of the U.S. military assets it has previously said are aimed at launching nuclear strikes on the North. Annual military drills between Washington and Seoul have long been a major source of contention between the Koreas, and analysts have wondered whether their continuation would hurt the detente that, since an outreach by Kim in January, has replaced the insults and threats of war. 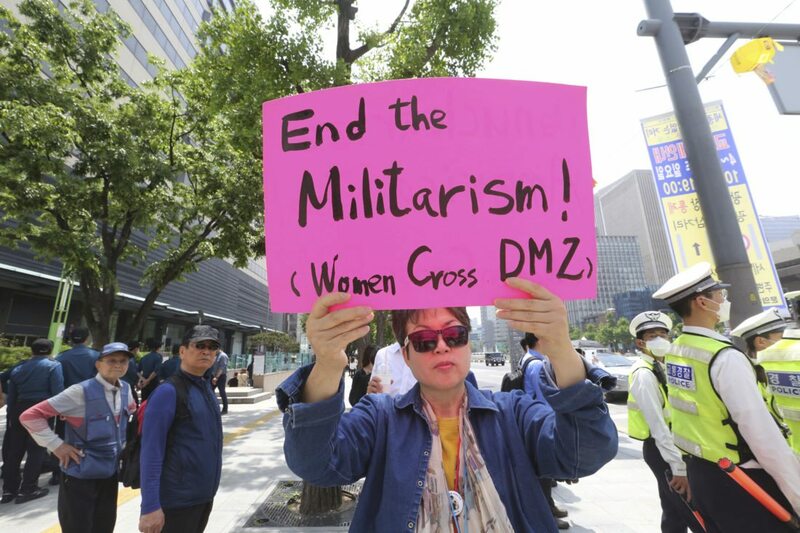 Earlier – and much larger – springtime drills, which Washington and Seoul toned down, went off without the North’s typically fiery condemnation or accompanying weapons tests. South Korean called North Korea’s move “regrettable” and demanded a quick return to talks. Seoul’s Unification Ministry spokesman Baek Tae-hyun said the North’s decision goes against the spirit of last month’s inter-Korean summit, where the Koreas’ leaders issued a vague vow on the “complete denuclearization” on the Korean Peninsula and pledged permanent peace between the rivals. He didn’t provide a straightforward answer on whether Seoul sees the North’s talks cancellation as potentially affecting the meeting between Trump and Kim. Army Col. Rob Manning said this current exercise is part of the U.S. and South Korea’s “routine, annual training program to maintain a foundation of military readiness.” Manning, a Pentagon spokesman, said the purpose of Max Thunder and exercise Foal Eagle – another training event – is to enhance the two nations’ abilities to operate together to defend South Korea. The North’s statement Wednesday comes amid a slew of surprising moves in recent weeks.